Solarstone ft Essence - Lunar Rings - Solarstone. It’s been the track that’s kept the forums of trance websites around the globe plenty-hot over the last few months. The juggernaut vocal anthem from ‘Rain Stars Eternal’‚ that has proved an unmistakable fan-fave… So it’s only fitting that ‘Lunar Rings’‚ gets its spotlight time to shine! 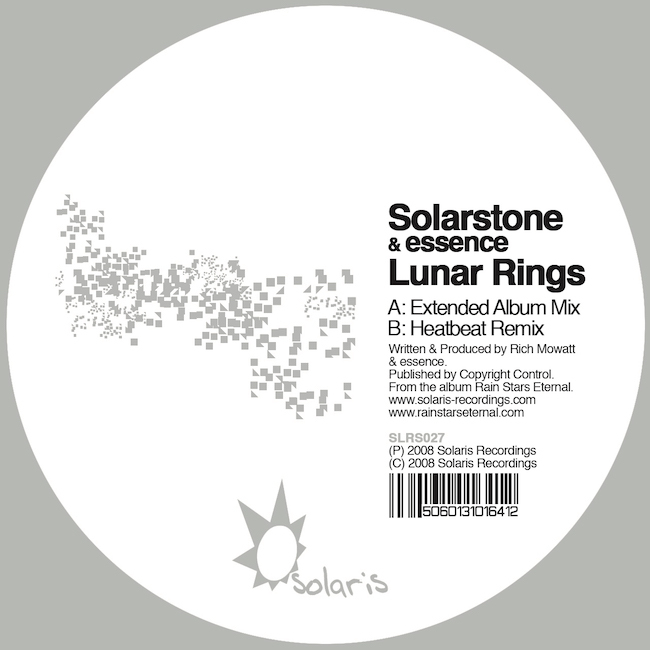 On his Extended remake, Solarstone has drawn ‘Lunar Rings’‚ out into a transcendent, coursing new club version; squeezing & teasing every last drop of essence’s vocal power into the mix. Argentinean adventurers Heatbeat lead out our troika of remixers with a great prog-fired rework that places its pumping beats under a stunningly crafted synth and string note arrangement. Setting the studio boxes into overdrive, Tritonal have delivered a huge euphoric retelling with an uplift factor of 11, it‚s destined to get spines tingling and feet shifting right into 2009. Last but by no means least Santerna’s Intro mix debuts with an elegiac 90 second beat-less intro before powering off in similarly large fashion!